Easy, inexpensive and impressive! A fantastic way to celebrate the ocean and Santa Cruz Coastline! What a great way to kick off your summer fun! Whether you are looking to entertain clients or family, enjoying the Monterey Bay from the O-Cat is an exciting and unique experience. To speak with a representative about how we can custom tailor an unforgettable experience for your group please call us at (831) 818-3645 or email us at sailingsantacruz@gmail.com. Sign-Up today to receive news about special events and charter deals! A company that plays together stays together! Why not escape the office for a few hours to build company spirit or entertain your clients? 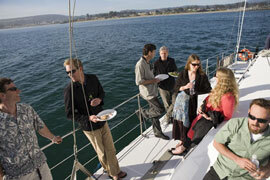 A relaxing sailing charter on the scenic Monterey Bay Marine Sanctuary is a sure crowd pleaser. You�ll find that sailing on the 65 foot Team O'Neill Catamaran is the perfect choice for corporate entertainment. Your crew will mingle under billowing white sails while taking in an unforgettable, panoramic view. Stable and relaxing enough for all of our guests to feel at ease and enjoy conversation, the catamaran also lends a feeling of excitement to any engagement. * 2 hour minimum on all charters (except for Memorials). * 50% non-refundable deposit to confirm. * Maximum capacity of 49 people on all charters. * 5% City Admissions tax on all charters. * Payment is due in full 10 days prior to sail date. A 10 % administrative processing fee will be collected if a charter is canceled up to 48 hours before departure. * All charters are subject to availability. If you are looking for a unique venue for your ceremony, the Team O�Neill Catamaran is the ideal setting for this most unforgettable event... just the 2 of you or up to 47 guests. Imagine exchanging vows on the Monterey Bay Marine Sanctuary either on a bright morning or a lovely afternoon just as the sun dips into the ocean and the sky changes from crimson to pastels. The scenery is romantic and the wedding pictures are unique. This is truly a one of a kind wedding that both you and all your guests on board will never forget! The experienced Captain and Crew will set the sails as you embark on your first journey together as newlyweds. 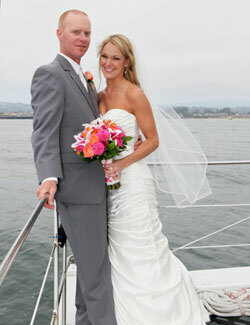 The ceremony takes place with nothing but the sound of the ocean and the panoramic views of the Santa Cruz coastline. Arrangements for ministers, flowers, photography and catering can be made with any of our local partners. 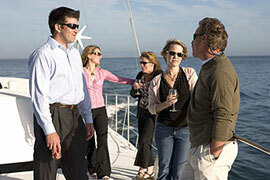 * All charters are subject to availability..
Are you looking for something unique and memorable for your next reunion? The Team O�Neill Catamaran is truly the ideal solution! Sailing aboard the O�CAT provides the perfect gathering spot to get re-aquatinted with family and friends as you enjoy the magnificent views, local wildlife and spectacular sunsets of the Monterey Bay. You can provide your own food and beverages or let one of our local caterers handle all the details. The scattering of ashes is a beautiful way for family and friends to say goodbye and celebrate a life lived . 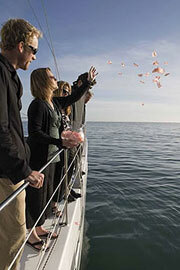 O�Neill Sailing Charters offers a respectful, dignified and caring memorial service on the Monterey Bay. The boat will cruise out of the Santa Cruz Harbor at which point the memorial service can begin. Family or friends may read a short passage, a prayer, or express personal memories of the deceased as the ashes and flowers are scattered on the Bay. As a final farewell, the Captain circles the area marked by the flowers, giving the family time for thoughts and remembrances. The Captain will present the family with a commemorative certificate stating the loved one�s name, date, time, location, longitude and latitude of where the remains were scattered. Memorials at Sea services are 1� hour�s in length and up to 49 family members and friends may accompany the remains of your loved one to their final resting place. A basket of flower petals are provided to scatter during the ceremony. Friends and family may also bring their own flowers. Coffee and bottled water are also provided. * All services will comply with Federal and State Laws and Regulations. Do you have any idea for a special charter? Birthday's, bachelor & bachelorette party's, wedding rehersal dinners, anniversaries? Give us a call with your idea and we'll put together an unforgettable experience for you and your crew!